Into electric cars, hydrogen engines, biodiesel; in fact any sort of alternative fuel vehicle? Here's the place for you - questions, tips, resources and electric car/alternative fuel vehicle news. Yep I agree with all the examples zzsstt. If I was riding regularly in the kind of conditions in your examples A thin fiberglass or carbon fiber pole with a flag or even better adhesive strip of 100 super bright LED lights that could strobe running the length of the pole. A simple dc-dc converter off the main battery pack. I agree in high risk conditions it would be a must do for my own safety. Not hard to overcome any safety issues. Actually summer night time riding is even safer with dual 1600lm lights on the front and another at the rear people think I am a car. All of my wheels have a glass fibber reflective tape on the sides so the bike really stands out. Lately the bike has just been used for some short social rides and the odd trip into town to get milk . Though I do plan on doing some much longer overnight or even several day adventures as the weather is getting better so will look into upgrading the safety - visibility for that. 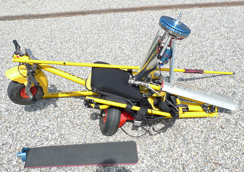 My plan for long distance multiple day rides is to use the boby trailer behind the trike. The trailer will hold my small hiking tent, sleeping bag, stove and generally what you would take for over night hiking trips. Although I wouldn't need any considerable food or water just snacks and a water bottle. If i program the bikes computer to limit max amps and use cruse control I consume around 8wh - km averaging 30kmh with only light - easy steady peddling. I would have around 1500wh of battery all up but like to only consume around 1200wh befor charging. That gives me a 150km range each day with all my gear. 5hrs of riding each day at 30kmh. Perhaps 2 1/2 in the morning then 2 1/2 in the evening.I don't need to do 150km each day but just what ever it took to get to the next camp. I would camp up for the night at caravan parks and pay the extra $5 for a 240v powered sight or better still get a normal non powered sight and get friendly with some one and slip them $2 to charge my bike from there plug. The bike would be ready for another 150km the next day. Opportunity charging is available in some parks, coffee shops and so on. If you ask nicely and pay a small tip to cover your 10 - 20c of electricity. There is one guy who rode his ebike 7000km across Canada. Charging each night at motel or prearranged friends house. Over there the have mains outlest at some car parks to plug in car engine heaters so he was able to charge from them. Even the odd powered road boards. Its a long video but if you have some time he gives a presentation on his 700km trip.Its very interesting .Justin actual own a ebike shop and is a very modest yet smart guy. he designed the electric bike computer I have on my bike. I am going to give it a trail run on a short 50km - 100 km return ride from Maleny to Kenilworth. Just as a chance to test the bike with all the gear and record some consumption data and camp by the river over night. Might even get my wife and daughter to drive the 4wd and camper van and meet me there. I would still pack my own tent and gear just to get a feel for the packed weight. Then if turns out good I will plan a 500km - 1000km trip in the future when I have a free week. That would sum it up.. My greatest concern would be for when you were in front of another car, and an overtaking one (annoyed at the slow car), cuts back in over the top of you.. because they were looking forward, not down/sideways..
BIG Flags really needed, and even then - BIG risk..
Electric powered ultralight trike anyone? I have started obtaining my license but I hate the sound ,cost and maintenance of the petrol powered rotax engine most use. 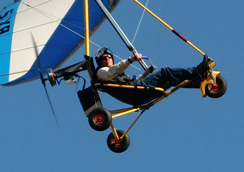 I would like to own my own Trike to fly but planing on going electric. You can see there isn't much to it but if you watch the video you can see just how amazing the experience can be. 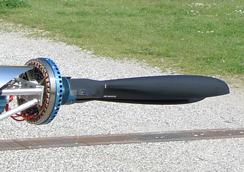 Do those hub motors offer any regenerative braking? I've not investiagted, but I'd assume they'd work as generators if wired correctly, and on long descents it would seem to be worthwhile harvesting the energy rather than heating up the brake! Yes if its a direct drive style hub motor then regenerative braking is possible and very common. You can gain on average (rule of thumb) around 10% longer range riding on undulating terrain. Not a lot but like you mentioned most people do use it as additional braking more than to charge the battery's. My controller has this option built in although I cant use it on my internally geared hub motor's or the previous RC motor and reduction drive. The reason being they are both freewheeling and not direct drive. Personally I much prefer to give up the advantages of regen for the ability to peddle the bike (human power) without fighting the cogging resistance of the motors magnets. 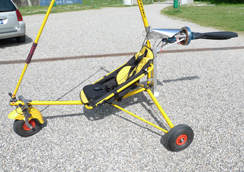 I often ride my trike as just a human powered bike and with battery removed and a freewheeling internal clutch I am at no real disadvantage other than the extra weight)( 3.8kg) of the motor and controller.This is a big advantage even when under power as its great for efficiency peddle assisting and coasting. Also if you have a issue with your motor you can get home easy with your legs. Peddling a direct drive motor not under power is like riding a bike through beach sand. I have my old big direct drive 5304 hub motor that isn't getting used for now. I wonder if it would make a nice wind turbine generator. I tend to get more gusty wind were I am but its usually on days with rubbish PV output i can get some more steady and strong winds. Could be a fun project. In regards to using a electric bike hub motor into a generator below is a demonstration video of how well they might work. Hmmm its got me thinking ...oh boy not another project, seriously though its really got me thinking I should be putting that old large hub motor to better use as its just laying around. He's quoted me a 24V 20Ah battery + Charger combo for $589. Is that a reasonable deal, or can someone suggest a better option? It looks to me like that price is for the full kit motor,controller,battery,charger. I'm assuming you just want a battery and charger? Its worth going to lithium on a ebike and you will not regret it.lifepo4 is a safe easy option for a first ebike pack. I have had a real good run using Headway lifpo4 cells. If It was me I would go with a 36v - 16A headway bank. Most ebike 24v controllers work fine at 36v as they usually have a minimum of 60v caps. You lower the current and gain a close to 30% more top speed. No, that price they quoted me was just for the battery and charger. It's not listed on his website.